Use pumpkin or winter squash interchangeably for this recipe. The vanilla may seem unusual but it sweetens and marries the flavors. Some squash are so sweet and scrumptious they only need a few drops. On the side offer additions of sharp cheddar, chopped cilantro, small corn chips. Heat stock and cream together in a heavy saucepan, whisk in pumpkin and seasonings. Let slowly simmer for about 15 minutes, stirring occasionally. Add vanilla last wait five minutes and then increase if you wish. The chips and cheese usually add sufficient salt but again season to taste. Every New Year I cut branches of shrubs and trees to force into early bloom. Think Spring! 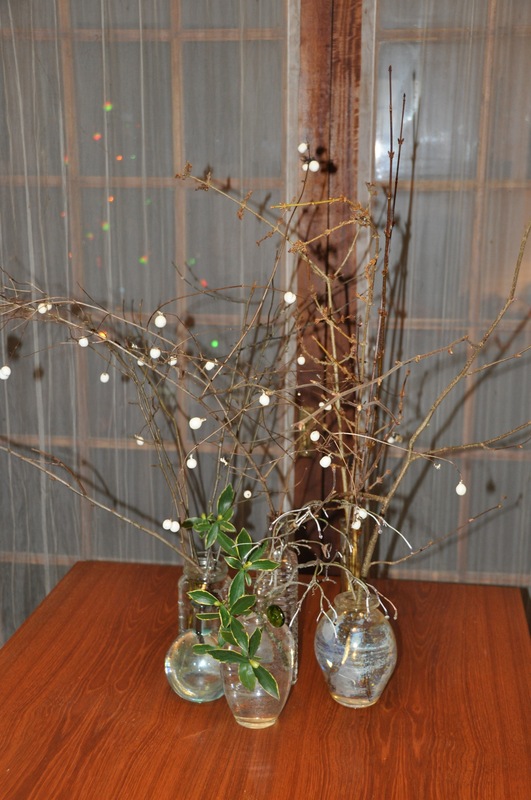 Now we have vases and jars of Flowering Quince, Forsythia, Dogwood, Daphne, Hazelnut, and Willow. A branch of Snow Berry adds a little substance to it all. When I brought in the branches the stems were gently scrubbed and recut before placing in water. The first few days it’s best to change the water daily. After three or four days if the buds are swelling I ease up. If buds are not swelling and branches are not using water your house may be too dry and a misting will help the buds open. Also cut off 1/2″ of stem to give them a fresh start. These are meant as simple directions for casual enjoyment of what’s in the garden at the beginning of a brand New Year. Place one variety per container since they bloom and leaf out on different schedules. I’ll put up more photos when we have color. Place these flowering stems in a bright area but out of direct sun.